Posted on February 25, 2011 February 26, 2011 by Pavel Y.
S.I.P. 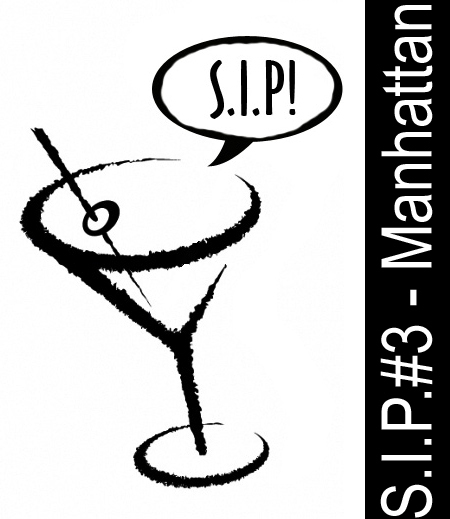 #3 – Manhattan – Sweet! Dry! Perfect? Now, we have a third S.I.P. – an exciting on-line event for Russian-speaking blogers-imbibers. If you are following my blog, you may know what the S.I.P. is something like a Russian-speaking MxMo. Previous two S.I.P. 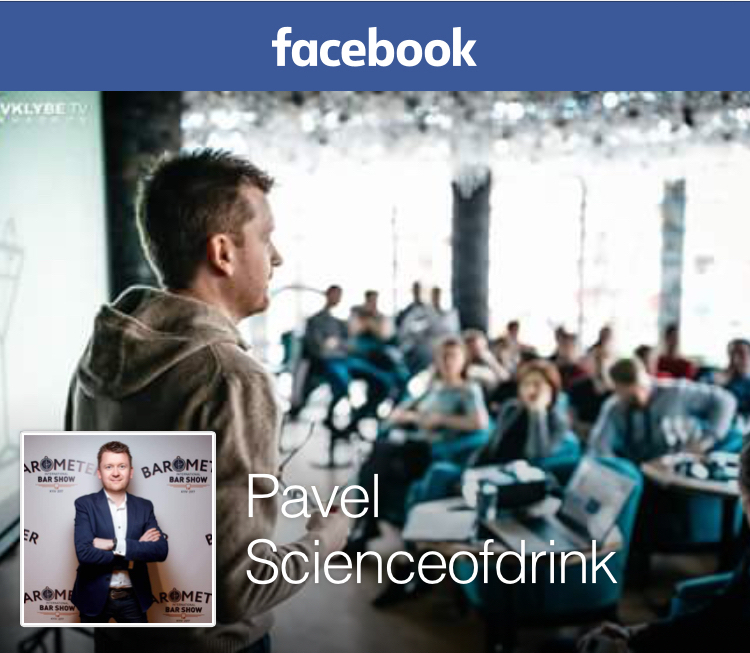 kindled the Russian-speaking mixosphere and gave rise to some new blogs. So we will see who will delurk at the today’s event! The main topic of the S.I.P. is the Manhattan. That’s a coincidence! Actually, I have had the Manhattan time during the last two months. The Manhattan is my passion. No, I should define it more precisely, the Manhattan is my challenge. 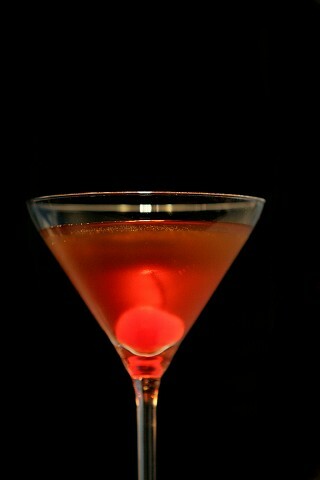 No other cocktail exhilarates me more than the Manhattan. The Manhattan is an absolutely magnificent cocktail with its own story, its unique composition and look. A popular story about the creation of the Manhattan Cocktail tells that the Manhattan was created in 1874 by a Dr. Iain Marshall for a banquet hosted by Lady Randolph Churchill (born Jeanette Jerome, a daughter of a notorious New York’s tycoon Leonard Jerome), the mother of one of the most outstanding Brits. The banquet was organized at the Manhattan Club in honor of an electoral victory of Samuel J. Tilden – the Governor of New-York, a famous politician and a Leonard’s old friend. The cocktail was named after his birth-place. Actually, I think, that Jeanette Jerome – a noted beauty and a member of New-York’s high society – was worthy to be a godmother of the Manhattan. But some notorious facts destroy the story. As a matter of fact, the banquet took place at the Manhattan Club, New-York, USA, on December 29, 1874. A very curious detail: as we know Sir Winston Churchill was born on November 30, 1874, prematurely, at Blenheim Palace, Oxfordshire, England. In the second half of the XIX century there was only one way to cross the Atlantic – by boat and the voyage normally took about two weeks! It seems improbable for a woman, who just has given birth, to travel a distance of about 3000 miles and organize the banquet. On the other hand, cocktail historian William Grimes specifies that Manhattan Club’s records indicate that the drink was invented there, but without noting of a precise date. He suggests that the banquet only popularized the Manhattan. Thus, the New-York’s origin of the Manhattan Cocktail is absolutely specified. In fact, as some competent people say, New-York was a rye-drinking city in the XIX century. So, American rye whiskey is an authentic type of whiskey for the Manhattan. Both bourbon and brandy came in after the Manhattan gained popularity in some other states. But then Prohibition turned everything upside down, all was changed. During Prohibition, whiskey as well as other kinds of liquor was not produced. American whiskey was dead. But Manhattan was not. The Manhattan Cocktail obtained new fresh blood – the Canadian whisky. 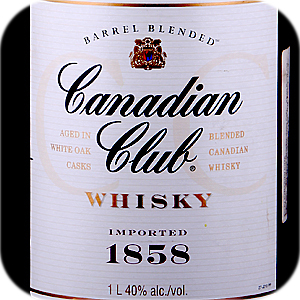 Actually, Canadian whisky, also called Canadian Rye Whisky, is quite a different type of whiskey. It has different maturing and blending methods but it makes use of similar to American whiskies raw materials – corn, rye, barley etc. Legal European bartenders and, of course, illegal bartenders of American speakeasies had a practice of using Canadian Rye in the Manhattan during the Prohibition. And it was then, I think, Canadian Rye Whisky became a third proper type of whiskey for the Manhattan. Well, we know that the Manhattan is a truly American cocktail which consists of whiskey, vermouth and cocktail bitters. The Manhattan has three standard executions – properly speaking, the Manhattan (‘Sweet’ Manhattan), the Dry Manhattan (with dry vermouth instead of sweet vermouth) and the Perfect Manhattan (with both sweet and dry vermouths in it). It seems toIt seems so simple. But actually the Manhattan has a great shade – potential which lies in using three pretty different types (-sic! Not trademarks, but three different types!) of whiskey. Vermouth also boasts a rich variety. And a range of cocktail bitters is unbelievably wide. It all makes a Manhattan quite a diverse cocktail though within a standard variation. 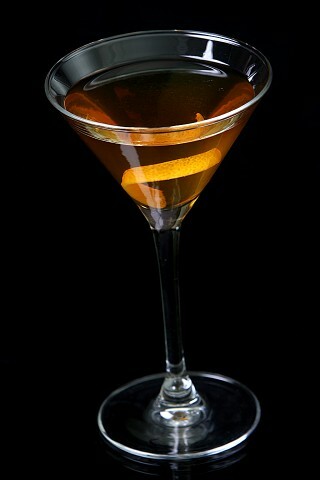 Now I decide to devote the entry to my favorite recipes of three typical variations of the Manhattan. I am exploring each of these over and over again. The recipes below reflect my today’s vision of the Manhattan. Stir all ingredients in a mixer glass filled with ice cubes. Strain into cocktail glass. Garnish with a red cocktail cherry. Actually I prefer to use Canadian Whisky in my Manhattan. If I am in proper mood I use smooth and not very spicy bourbon. I regret to confess that I have only one bottle of American rye and do not use it in my Manhattans. Why? Because WILD TURKEY Rye 101 proof is an extremely powerful spirit and it easily kills my ordinary vermouths in the Manhattan. That result is categorically unsuitable for me. My Manhattan is about vermouth, not whiskey. The Manhattan, I am concerned with , is not the Old-Fashioned one . The idea of the Manhattan lies in pairing vermouth and whiskey and not in making whiskey easy to swallow. My average Manhattan is a well-balanced, smooth and little spicy potation with some velvet bitterness. Properly made it is quite a libation. Stir all ingredients in a mixing-glass with a lot of ice. Strain into a chilled cocktail glass. Garnish with a lemon twist. Another important point is using orange bitters instead of Angostura for a great dry taste. I prefer using light bourbon like Four Roses in my Dry Manhattan. My Dry Manhattan is a pretty dry cocktail. Not fabulous but dry enough. Both bitters and essential oils of lemon peel help drying the cocktail. The entry is dry with a hint of bourbon sweetness, the palate is dry and herbal, and the finish is complex with prevailing bitterness of citruses. My average Dry Manhattan is a well-balanced, dry and moderate cocktail. Well, and now some words about the Perfect Manhattan. The next recipe I have borrowed from the one of my favorite cocktail book ‘Cocktails and Mixed Drinks’ by Anthony Hogg. Stir all ingredients with a lot ice in a mixer glass. Strain into a cocktail glass. Garnish with a cherry and lemon peel. Basically, the perfection of the cocktail lies in equal ratio between whisky and vermouths not in equal ratio between vermouths. My Perfect Manhattan is a herbalicious, well-balanced cocktail with moderate spiciness. Actually the balance of it is quite close to my average Manhattan. It is the golden mean of Manhattans. 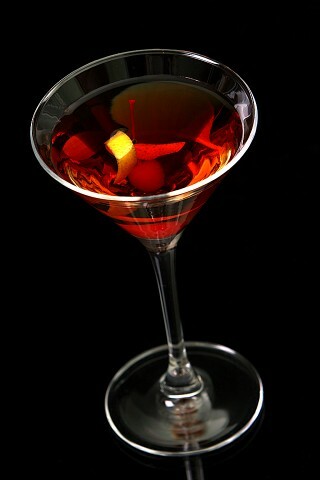 By the way I often prefer the Perfect Manhattan with Peychaud’s bitters instead of Angostura. It gives yet another kind of bitterness, you know. 1. Rye you must. But Canadian whisky works quite well too. 2. Good vermouth makes a good Manhattan. A crap makes a crap. Cinzano works. 3. No Manhattan without bitters. But I mean bitters in quite a wide sense. Palatable bitters sometimes work as good as cocktail bitters, but the Angostura is that will do. 4. Do not shake the Manhattan, it will bruise an excellence. 5. Garbage in, garbage out. And, one drop of poison infects the whole tun of wine. There is no place for any drop of chemical cherry juice in the Manhattan. So, macerate your own cocktail cherries or wash well commercial cherries for garnishing good Manhattans. 6. It seems ‘so bitter’ for you? Leave it and leave me alone! Как всегда исчерпывающе, всеохватывающе-занимательно интересно. А мне не горько и не сладко. Мне бы кисло. Супер! Не сочтите за лесть.В воскресенье как раз с Бали прибудет джин Танжер и Зелёный волкер,арак и сакэ! Полностью согласен. Если клиент Гарри Джонсона хотел дёрнуть виски, он так и говорил: “Старина, виски на два пальца и поменьше содовой”. Вермут же – это особый напиток, который также самодостаточен. И в больших количествах – потенциальный лидер. Особенно итальянский, сладкий. Но в наших условиях… не уверен. Пью я сейчас Манхэттан с не поспевшим к СИПу Maker’s Mark и Cinzano в пропорции 2:1. Понимаю, что мне не хватает более сложного бурбона, способного сбалансировать грубость Чинзано. Простите мне “пальцы”, но премиальный бурбон спасает при отсутствии хорошего вермута, который должен стать сердцем коктейля. ЗЫ. много раз замечал, что апельсиновый биттер работает намного тоньше и удачнее ароматического. Не везде, но очень часто. Согласен, что основная задача канадца – укрепить коктейль, и не мешать вермуту с ангостурой (с хорошим вермутом, ангостура наверное тоже ушла бы на второй план). Но вот с бурбонами ситуация помоему меняется, тут уже идёт игра наравне. Первое: Тоже нормальных вермутов хочу!!! Но где ж их возьмешь? У нас периодически и Чинзано пропадает. Так что радуюсь когда завозят полулитровые бутылочки. Второе: Вижу большинство народу подметило, что в Манхэттене гнаться за премиальными вискарями не стоит, если хочется получить ожидаемый приемлемый результат. Хоть что-то обобщающее для себя вынесли. Третье: Отлично все таки посидели, получилось очень продуктивно в этот раз. Всем большое спасибо! Все: Пошел допивать свой последний Манхэттен на сегодня, на этот раз на роме! Carpano Antica – очень опасная штука. Попробовав его однажды, на то, что продается у нас в супермаркетах, смотреть уже не захочешь. Спасибо, Паш, большое за отличный пост. Твой тезис про главенство вермута для себя я списываю на то, что заветные бутылки тебе в руки не попадались. А с чего вы, кстати, взяли, что биттер должен быть один? Почему не попробовать несколько в одном коктейле? Но надежда есть. Вот Саша пишет, что СА – опасная штука ;) Не буду скрывать, я питаю надежды в отношении этого вермута, много читал о нем, думаю, что он будет лучше. Плюс уверен, что одним только СА мир прекрасных вермутов не ограничивается, так что, как говорится, будем искать! ;) уши, да, сильно торчат ;) я думаю ты учел, что ММ ж довольно буйный, а вот если что взять посуше, поаскетичнее, так там вообще! ММ вполне подошел, биттер его подсушил, а вермут дал глубины “деревяшке”. Другое дело, что я видел тут вместо апельсинового биттера кирш. И хотел бы уйти в оппозицию ко мнению, что не нужен нам мощный и сложный виски в Манхэттане в отсутствии такого же вермута. Кстати, вчера последний коктейль был как раз из этой оперы. Первые два, это, конечно, шлак. Ну, пусть не шлак, но так :| А вот последний, саймоновский, это очень правильный пример компенсации. SoCo навалил сладости и фруктов, Чинзано неплохо травкой сработал и Пешо, на котором я не стал экономить, добавил объема. В итоге получился вполне себе интересный 1:1 ‘Сладкий’ Манхэттен, с ярким и запоминающимся вкусом (кстати, не замечал, что бурбоны очень любят раскрываться на сладком фоне?). С интересом читаю Ваш сайт. Сегодня попробовал приготовить Манхэттэн, но вот результат не порадовал. До этого пробовал его в баре, и решил повторить дома. Но, видимо, где-то накосячил. По составу – Canadian Club (ординарный, как на вот этой картинке – http://www.scienceofdrink.com/wp-content/uploads/2011/02/canadian-whisky.jpg) + Чинзано Россо + 2 “плюха” ангостуры. Пивной бокал на 2/3 заполнил льдом и в течение примерно минуты перемешивал.Потом процедил в бокал. На выходе получилась сильная горечь с водянистым привкусом. Сказать, что разочарован – ничего не сказать. 1) минута размешивания – это слишком много. У меня вроде в руководстве написано, что размешивать коктейль стоит 30 раз в случае мелких кубиков и 50 раз в случае крупных, этот процесс вряд ли займет более полуминуты. Второй нюанс, который остался за кадром – это температура и качество льда. Обратите внимание. Это причина излишней водянистости, горечи впрочем тоже (излишнее разбавление искажает вкусы). 2) Пропорция. Горечь – это в любом случае ангостура. Не нравится горькое – уменьшайте количество ангостуры. Соотношение компонентов и их количества тоже важно, но оно за кадром. 3) С чем сравниваете, это тоже важно :) В баре пили какой коктейль? Тут тоже может быть подвох, как в лучшую сторону (премиальный бурбон или рожь, карпано антика и возрожденный бокер или наоборот – джек дениелс с вермутом вообще без биттера или с каплей горечи типа ферне бранка или кампари, как у нас в барах часто бывает). 4) СС+Чинзано россо+ангостура+стир+вишня – все в целом дает хороший, правильный (IMHO, как все на этом блоге) Манхэттен, который когда-то меня потряс и открыл во мне интерес к этому коктейлю, это серьезно (хоть сейчас я все же предпочту виски чуть получше). Но это не значит, что этот же Манхэттен должен понравится вам, помните, что на вкус и на цвет товарищей нет.